How often has your data been stolen because someone connected an unauthorized USB to your computer and copied your files? Well, you don’t need to worry because the solution to disable or enable USB Ports is pretty simple. USB Lock is a data leak prevention tool that prevents leakage and copy of your data to USB Drives (Android phone/iPhone), External Drives, CDs/DVDs or other such portable devices. Once installed, USB Lock lets you block all such drives and devices that do not belong to you. USB Lock can stop stealing or hacking and you can share your PC with anyone without fear of data theft. This is an easy USB Secure Software and powerful Endpoint DLP Suite that helps you to lock usb port,make dvd/cd burner read-only, block some websites, forbid some programs and disable more devices. Prevent data on your USB storage device to be accidentally deleted or even accessed by unauthorized users with the help of this practical application. This application allows you to protect valuable file(s) containing in your USB storage devices from accidentally modified or deleted and prevents unauthorized user from connecting their USB Storage Devices and copying your valuable files. 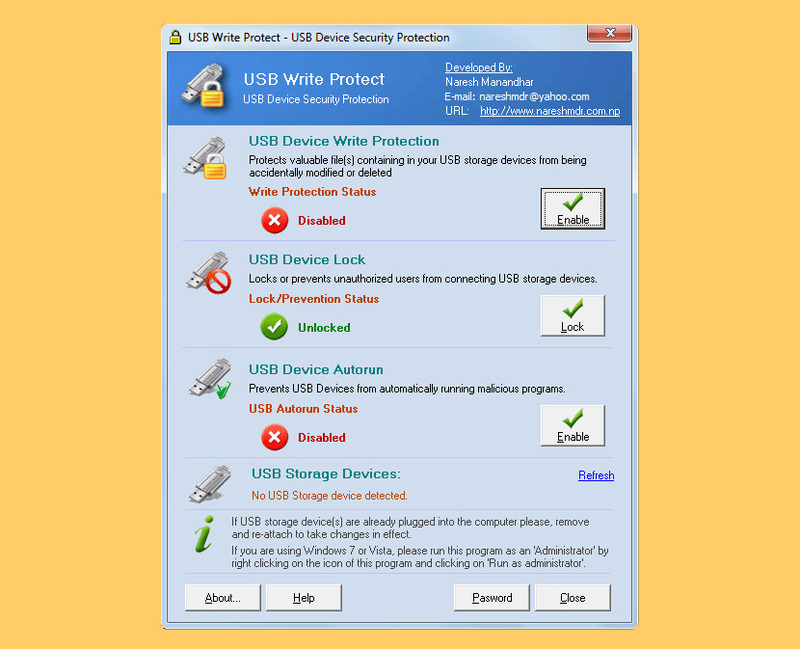 USB Write Protection – Protects valuable file(s) containing in your USB storage devices from accidentally modified or deleted. USB Device Auto-run Control – USB storage devices are the one of the major sources of virus and other malicious programs. It protects your computer from viruses and other malicious programs by disabling USB Device’s auto-run function and preventing them from automatically running and transferring to your computer. Password Protected Settings – You can protect your protection settings by password and prevent unauthorized users from changind your protection settings. A compact, portable and easy to configure Windows utility which helps you use your USB disks more securely. With this utility, you can easily disable USB devices, write-protect these, or deny application execution from the USB disks making common viruses execution and spreading difficult (if not impossible). Disable USB Disks, disable all your USB removable disks to disallow read or write on the USB removable disks. This way user will not be able to transfer files to and from the USB disks to your machine. The disable is system level, so not only it will not display in any UI, but will not be accessible for any program as well. Works great on Microsoft Windows 10. 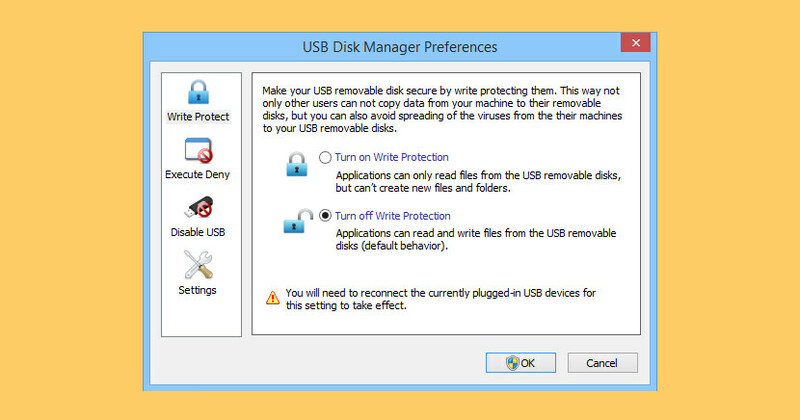 USB Disks Access Manager is a free Windows utility that allows you to manage access to USB disks. There are three options to choose, access to read and write, read only and does not detect the USB disks. A freeware tool for user or administrator who wants to control access to their computer trough USB removable disks. Read & Write Access to USB Disks – This is the default setting that allow computer to read and write to USB disks. Read Only Access From USB Disk – This option allows the computer can only read it from USB disks. 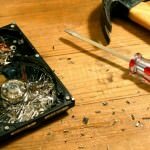 In certain cases you may not want the files on your computer are copied to the USB disks that plugged into your computer. Disable USB Disks Detection – When this option is selected then all USB disks plugged into the computer will not be detected. In certain circumstances you may not want arbitrary file transfer to or from your computer. This option allows you to do it. The USBGuard software framework helps to protect your computer against rogue USB devices by implementing basic whitelisting and blacklisting capabilities based on device attributes. 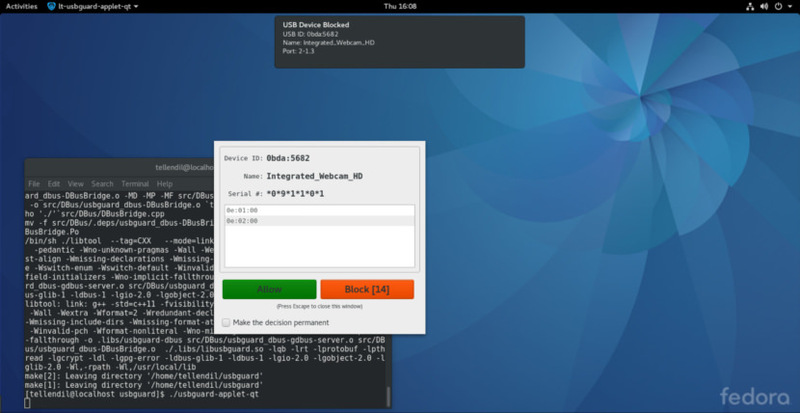 Currently, USBGuard works only on Linux. To enforce the user-defined policy, it uses the USB device authorization feature implemented in the Linux kernel since 2007. How often has your data been stolen because someone connected an unauthorized USB to your computer and copied your files? Well, you don’t need to worry because the solution to disable or enable USB Ports is pretty simple. GiliSoft USB Lock is a data leak prevention tool that prevents leakage and copy of your data to USB Drives (Android phone/iPhone), External Drives, CDs/DVDs or other such portable devices. Once installed, USB Lock lets you block all such drives and devices that do not belong to you. USB Lock can stop stealing or hacking and you can share your PC with anyone without fear of data theft. This is an easy USB Secure Software and powerful Endpoint DLP Suite that helps you to lock usb port,make dvd/cd burner read-only, block some websites, forbid some programs and disable more devices. For the convenience of enterprise users to deploy, or secondary development, we also provide the command-line version, please contact us if you need. Block USB/SD Drives – Disable reading from USB/SD disks or disable writing to USB/SD disks. It doesn’t allow any type of USB/SD drive to access your computer unless you authorize it or it has been in trusted devices White-list. 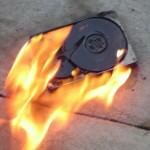 CD Lock,Block Media & Blu-ray Discs – Disable reading from DVD/CD discs or making DVD/CD burner read-only. This application also blocks any disc that uses the disk hub, bay, combo or CD/DVD drive and allots a drive letter. Trusted Devices White List – You can create a whitelist to allow ‘certain approved’ USB pen drives. Then it will block all USB drives except the ones in the white-list. Reports & Logs – USB Lock provide full reports and logs: (1) USB Activity – Monitor all file operation (like create delete files ) on all USB disks that connected to your computer. (2) Deny & Allow Access History. (3) Activity White List. Website Lock – Block accessing some websites. This utility allows you to block unwanted websites from display in Internet Explorer. If a website is blocked the user is forwarded to a blank page or to a “blocked page” and the contents of the original page are not loaded on your PC. Devices Lock – The program can be used to restrict read or write access to removable media devices such as CD, DVD, floppy, SD Card Readers, flash and USB drives. It also can be used to disable iPhone, Android phone, printer,modem, com lpt ports,infrared, blue-tooth, 1394 ports. Programs Lock – Block running any programs, including IE, Outlook, AOL, AIM, Dropbox, and more. You can even lock your control panel with one button click. Powerful Self-protection Mode – Nobody can uninstall this software without password and you can hide this program in Invisible Mode. When someone enters wrong password more than 5 times, it will send alarm notifications to your pre-defined e-mail and the unknown login will be temporarily banned. Copy Protection – The program uses an advanced level of data leak prevention technology that does not permit duplication of your important files and copyright material to any USB drive or other such storage devices without your permission. Data Leak Prevention – It prevents your data from getting leaked out to USB drives and other such storage devices by letting you control which device can access your computer while blocking all other unauthorized devices that do not belong to you. Endpoint security solution MyUSBOnly prevents unauthorized access to USB devices and Prevent sensitive data from leaking out and secure your files. Whether you’re an IT professional, a small business owner, or just someone who cares about sensitive data security, MyUSBOnly can help protect you against data theft. Lock the Bad Guys out of your USB ports. A flexible and lightweight solution for USB lock-down. Thanks for informing us, it was free when I first publish the post. I’ve updated the article and de-list it from our list. Thanks again. gilisoft usb lock is the best one in this list!